Dip into one of the 2 outdoor swimming pools or enjoy other recreational amenities including a sauna and bicycles to rent. Additional amenities at this apartment include wireless Internet access (surcharge), concierge services, and shopping on site. When you stay at this apartment in Arona, you'll be near the beach, within a 10-minute drive of Los Cristianos Beach and Siam Park. This apartment is 1.9 mi (3.1 km) from Las Vistas Beach and 3.2 mi (5.2 km) from Aqualand Costa Adeje. Take advantage of recreation opportunities such as an outdoor pool or take in the view from a terrace and a garden. This aparthotel also features complimentary wireless Internet access and concierge services. The modern, 3-star Sol Arona Tenerife is close to Los Cristianos’ golden beaches and the Medieval Adventure. The hotel offers a buffet restaurant serving slow cooked food throughout the day, an outdoor pool with a sun terrace with bar and a 24-hour fully equipped gym. The light-coloured rooms each feature a TV, balcony, writing desk, and a private bathroom. The 4-star Labranda Hotel Reveron Plaza is found in the centre of Los Cristianos and just minutes’ walk from the beach. The family-run hotel offers a 4th restaurant and open-air pool on the 5th floor, which both provide panoramic views of the port and surrounding area, and there is also a library and spa and sports facilities on-site. Rooms are air-conditioned and have TVs, free wi-fi, balconies and private bathrooms. The modern 3-star Checkin Atlandia Bungalows are found near the town of Los Cristianos and the natural beauty of Montana de Guaza. The complex has 3000 square metres of gardens, a 24-hour reception area with currency exchange and mini-market and restaurant, as well as an attractive open-air pool. Each apartment has been renovated in a contemporary style and has a kitchenette or full American-style kitchen, satellite TV, separate bedroom and bathroom. The hotel is located in the traditional fishing village of Los Cristianos, one of Tenerife's most emblematic spots, known for its beautiful beaches, port and the wide variety of restaurants, bars, shops and other points of interest.With its seafront location in the village of Los Cristianos, the H10 Big Sur is a Boutique Hotel that specializes in adults’ holidays. This exclusive hotel has been fully refurbished with an elegant, Mediterranean interior design with a vintage touch. Discover its range of services, including the Blue Bay Restaurant (with buffet and show cooking for breakfast and dinner), Cactus Bar (by the pool) and Naturalia Terrace (à la carte restaurant for lunch), new outdoor pool area, Chill-Out terrace with sea views and Despacio Beauty Centre. The former fishing village of Los Cristianos is nestled on the south coast of Tenerife, the largest and most heavily populated of the seven Canary Islands. Although now a popular tourist resort with lots to keep newcomers entertained, the town has retained some of its charm and visitors are guaranteed a warm welcome. 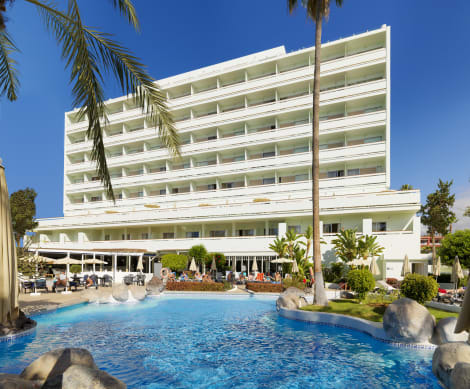 Looking to find a great selection of Los Cristianos hotels online? We have a wide range of accommodation options available, so check to see if there's something to suit your lifestyle and budget. If your idea of a break involves relaxing on sandy beaches, bathing in clean waters and having a wide range of activities and attractions on tap when you're in the mood, Los Cristianos is sure to appeal. The resort's main beach, Playa de Los Cristianos, is a hive of activity. Many visitors to the area come to enjoy its soft sand, sunbeds and excellent facilities. You'll find plenty of opportunities to try your hand at some new water sports too, including sailing, windsurfing and bodyboarding. Take a stroll along the palm tree-lined promenade that borders the beach towards the town's picturesque harbour. Carry on and you'll come to Playa de las Vistas, an artificial stretch of golden sand that has clear, calm waters thanks to the bay's water break. The Monkey Park, situated on the outskirts of town, is a breeding centre for endangered animals - primates in particular. Pay a visit to learn all about the residents and discover how the centre's breeding programme works. If you're in the mood to take to the open sea then consider booking a place on a fishing charter boat. Alternatively, you could sign up for a gentle guided walk through laurel forests and along coastal paths. More adventurous souls might want to head into Teide National Park for a trek around the rim of the now extinct Mount Samara volcano. The pedestrian area behind the promenade in Los Cristianos is where you'll find the bustling town centre with its excellent selection of shops, selling everyday essentials alongside gifts and local craft items. Prices here can often be more reasonable than for similar items on sale a little further along the coast in Playa de las Américas. Wander along the beachfront in Los Cristianos and you'll be faced with a huge range of dining options, with something to suit all tastes. The Willows is known for its tapas dishes and friendly atmosphere, and Rincón del Marinero is a recommended spot for seafood dishes. Pizzeria Daccapo offers quality Italian cuisine at affordable prices, while Garibaldi focuses on serving meat and pasta dishes in a more intimate setting. For live music sessions and a friendly atmosphere try an evening at The Claddagh, or swing by The Swan on karaoke night if you're in the mood to let your hair down.